Comprehensive review of Loving Tan Deluxe Bronzing Mousse Ultra Dark. See what real experts and actual users have to say about this self tanning product. I give Loving Tan Deluxe Bronzing Mousse Ultra Dark 2.5 out of 5 stars. I found it to be a pretty average self tanner. Based on Loving Tan’s social media, I was expecting to have a super dark tan from this Ultra Dark shade. Unfortunately, that just wasn’t the case. I didn’t find the Ultra Dark to be that different than their dark shade. That just tells me that a lot of their social media photos are heavily edited in order to make the tans look very dark. After trying it, I had a medium to dark tan. Now, the color was very nice looking, just not nearly as dark as I was expecting it to be. I’ve seen girls on their social media that looked extremely dark, and those photos are either doctored or they were taken before they washed the guide off. So don’t let those photos fool you! My tan lasted around 5 days, which is good. But it got pretty patchy as it faded. The smell is decent, but the next morning it smells like DHA. I was happy with the drying time; it took about 20 minutes, which is pretty average. So overall, I think this mousse is very average and I gave it 2.5 out of 5 stars. This product comes out as a dark foam. The foam is dark in color due to the dark brown guide. The guide is actually darker than most out there. The foam isn’t as robust and fluffy as some, and I found it to be a little bit watery. If you’re not careful, application will be very messy with this mousse. You absolutely have to wear a mitt or latex gloves or else the guide will stain your palms because it’s so dark. Since the guide is so dark, you can see where you’re applying it on your skin. The guide does take about a minute to blend into your skin, and until it’s completely blended, it will look a little streaky. 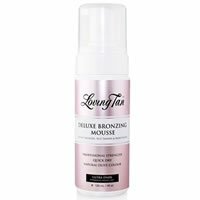 Loving Tan Deluxe Bronzing Mousse Ultra Dark is a pretty thin mousse, so you kinda need to apply it quickly before it melts. And be extra careful that it doesn’t drip on anything! Once I had applied it all over my body, I looked SO weird because the guide is so dark. The guide actually looked kinda red/pink once applied to my skin. This self tanner took around 20-25 minutes to fully dry. Loving Tan Deluxe Bronzing Mousse Ultra Dark smells okay. It has a light fragrance smell, but I could also smell a little DHA mixed in there. It doesn’t smell as good as their Dark formula; I think it’s because this one has more DHA in it. The next day I absolutely reeked of DHA. The self tanner smell was so strong, it made me nauseous. The smell even stuck around a little after I showered the tanner off! I liked the color I got from this self tanner, but it was nowhere near an “Ultra Dark” shade. My tan was more of a medium to dark color. Based off their social media, I was expecting to be VERY dark, but that just wasn’t the case. That just shows me that a lot of their photos are heavily edited and doctored. Or maybe they take photos while the guide is still on, but that too is misleading. I found most of my color came while I still had the guide on my skin; I was SO dark. But once I showered the tanner off, I was left with a medium to dark shade tan. My tan was pretty even looking, although my ankles and elbows looked kind of funky. So I didn’t dislike my tan, I was just expecting it to be darker based on it being an “Ultra Dark” shade. So that left me a bit disappointed. But if you’re looking for a medium shade tan, this one is a very nice color. My tan lasted around 5 days, which I was pleased with. But as it faded, it looked really dry and scaly, which wasn’t pretty. I had to exfoliate a lot to get it off faster so my skin didn’t look diseased. No. It’s not dark enough, and it’s pretty pricey. Loving Tan Deluxe Bronzing Mousse Ultra Dark is $40 for a 4-ounce bottle. That’s $10 an ounce, which is more than most self tanners out there. To buy Loving Tan Deluxe Bronzing Mousse Ultra Dark, Click Here. Look and Feel This is a thin, brown foam. Application Applying is messy due to the texture and the guide. Smell (Before) Smells okay, like fragrance with a little DHA. Smell (After) Smells so bad the next day, like DHA. Color Produced My tan was a medium to dark shade. Price It’s super expensive at $10 per ounce.